On August 9, 2009, it would be fair to say that we are a week or two late starting a magnolia diary. M.campbellii is already in full flower down in our park. 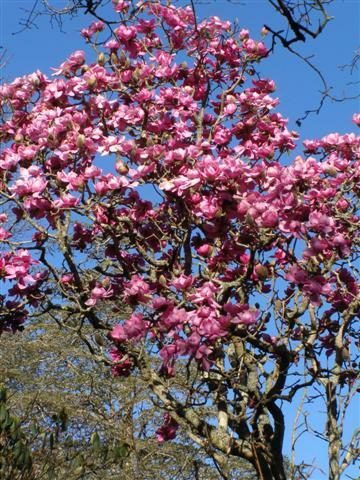 Our tree dates back to the mid 1950s and is one of the oldest magnolias we have here. It is set in front of distant Mount Taranaki, our near perfect iconic volcanic cone and the reason why the movie, The Last Samurai, was filmed locally. It is cheaper to film here than in Japan and our mountain is a reasonable ring-in for Mount Fuji (I have even encountered a film crew shooting a Japanese car commercial down our road!) In New Zealand, campbellii is the first to flower and at times it can be a close run thing to see if the leaves fall before the flowers open. M.campbellii with Mount Taranaki beyond at Tikorangi The Jury Garden, Taranaki New Zealand. Magnolia Vulcan is opening its flowers. The tree in our carpark has maybe a dozen early flowers open but it is clearly warmer down the driveway where a Vulcan tree has many more flowers. The original tree, bred by Felix Jury, is in the neighbour’s property (formerly the Jury farm) and we no longer have access to monitor it. Vulcan was a true colour break in its day and opens remarkable wine coloured flowers in NZ and in Australia. However it is patchy at best in Europe and inclined to be disappointing in the UK. We rate it as a small tree here. The first flowers are always the deepest colour and the largest in size. The original Lanarth in our park is a week into opening though not quite at its peak yet. It shows blooms in that beautiful, intense stained glass purple but also pale flowers at the same time. This tree dates back to the mid fifties and it took three attempts to import and successfully establish the genuine article. 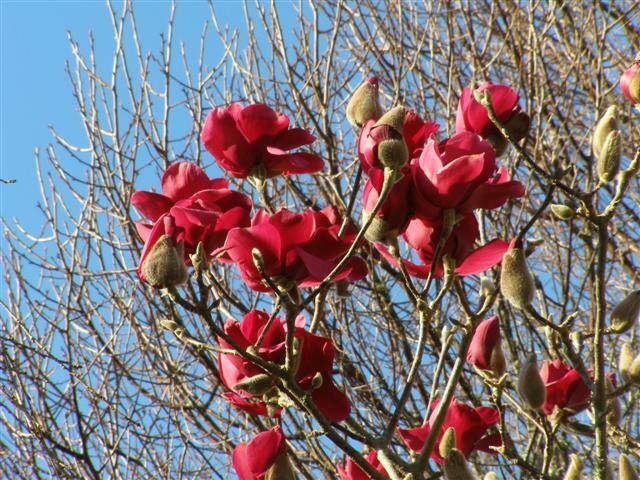 One of the early attempts, however, yielded up the Lanarth seedling subsequently named Mark Jury, which became the secret weapon in the early magnolia breeding programme here. Mark is not yet showing colour. Magnolia Black Tulip in warmer positions on our property has opened its first flowers but the original tree has yet to show colour. We have the very first flower on Felix Jury opening. Along with M. campbellii, our reds are the earliest of the season. Our winter this year has been colder than usual (visible frost on a number of occasions although we rarely drop below zero degrees celsius at night), drier than usual, not very windy but with our usual high winter light levels. 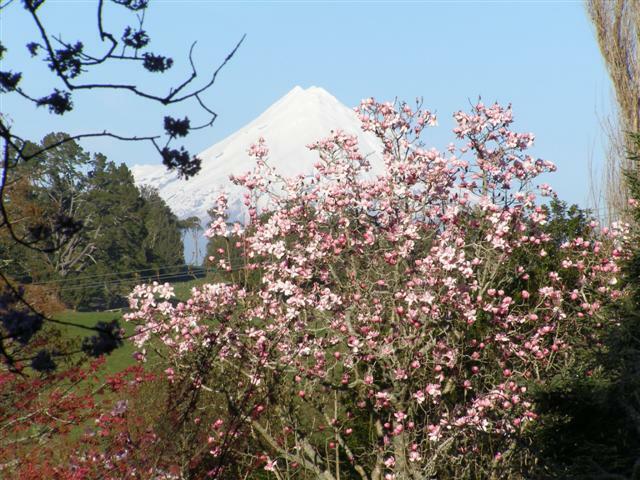 This entry was posted in Magnolia diary and tagged Jury magnolias, M.campbellii, Magnolia Black Tulip, Magnolia Vulcan, Mark Jury, New Zealand magnolias, red flowered magnolias, red magnolias on 9 August 2009 by Abbie Jury.